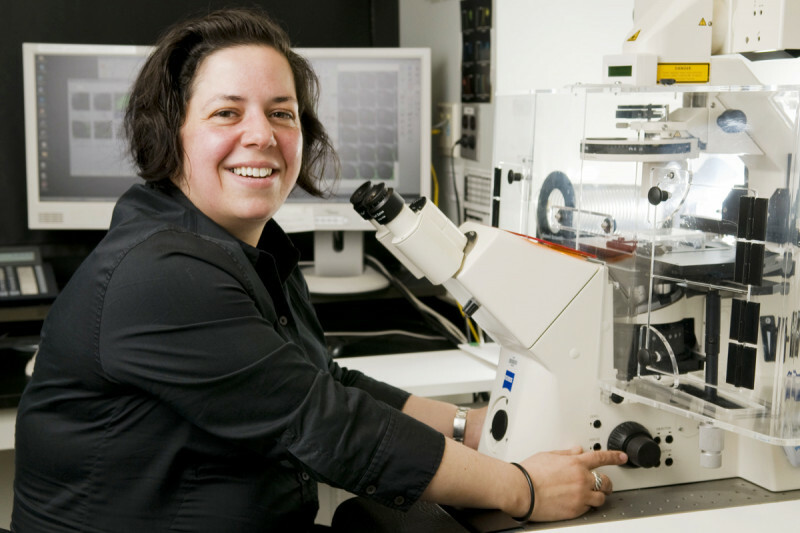 Developmental biologist Kat Hadjantonakis works to gain insights into the critical events that direct the formation and shape of mammalian embryos. We spoke with Dr. Hadjantonakis about her work in 2009. I cannot remember a time when I wasn’t intrigued by science. When it came time to pick my major as an 18-year-old entering college, my first inclination was to go to medical school, which, in the United Kingdom, is begun as an undergraduate. Two months before school was to start, I had a change of heart, deciding that my real interests were in research. In 1987, I enrolled at Imperial College London to pursue a degree in biochemistry. My only exposure to developmental biology as an undergraduate was in fruit flies. It wasn’t until I went on for my PhD in molecular genomics, also at Imperial College, that I began working in the mouse, and this led to the development (excuse the pun!) of my interest in the embryo. After all, what was the point of mapping the genome if one did not go on to probe its function? Within the following year, I arranged to do a postdoctoral fellowship with her. Unfortunately for me, Rosa, who was at the Centre for Genome Research (now renamed the Institute for Stem Cell Research) in Edinburgh, decided at this time to move to London. I saw my postdoc fellowship as a perfect opportunity to leave London, where I had essentially spent my entire life up to that point, so I asked Rosa if she could recommend any other labs. She suggested that I work for her graduate school colleague Janet Rossant, a world leader in developmental biology who was at the Samuel Lunenfeld Research Institute (SLRI) in Toronto. Janet had helped to pioneer the basis of modern day mouse embryology and the use of embryonic stem cells to generate genetically modified mice. I was very excited to accept a position in her lab in 1996. In this lab, I’d be working at the forefront of embryonic stem cell technology and mouse embryology. In actuality, I was able to do what was in essence a joint postdoctoral fellowship in two labs at SLRI, working with both Janet and Andras Nagy, which for me meant that I had the best of both worlds. SLRI was one of the first few institutions to use embryonic stem cells for generating knockout mice. And the tetraploid chimera techniques that are now commonly used to generate cloned mice were pioneered in Toronto by Andras Nagy. For me it was an intoxicating and enthralling environment to work in. I was able to work with embryonic stem cells at the premier institution. I began to appreciate mouse biology, learning how to work with embryonic stem cells to generate genetically modified mice and then desciphering the effects produced by “knocking out” specific genes. When I arrived in Toronto, I was asked, “What are you interested in and what do you want to work on — embryonic or extra-embryonic tissues?” At the time, I was rather taken aback by that question. The characteristic feature of the mouse embryo is that it develops inside the mother in utero, as do human embryos. It was very fundamental in my “growing up” as a developmental biologist to learn to appreciate the importance of extra-embryonic tissue. It was around this time that Rosa’s lab published what turned out to be a landmark study showing that it is the extra-embryonic tissue that instructs the embryo where to form the head and the tail, creating a crosstalk between the embryonic and extra-embryonic tissues. It also became curious to me that I was investigating how the embryo forms, which is a very dynamic process, but the majority of experiments I carried out were on dead embryos. I had a “Eureka!” moment when I realized that the way forward was to start to look at living embryos. Why infer dynamics through the observation of multiple embryos, when in fact what we really needed to do was to look at a single embryo over time? There began my quest to develop tools for mouse imaging, which is what we are still doing today in my lab at SKI. We can use genetics to understand how the embryo is put together, but by live-imaging we can understand how individual cells go about building complex morphological forms. There were several obstacles that needed to be overcome. For a mouse embryo, we would need to develop methods to allow us to take an embryo out of its natural (in utero) environment and culture it in such a way that we could image it during its development. Getting a glimpse into the window of mouse development would allow us to understand the dynamics of the process we were studying rather than simply making inferences about it. As a result, a major focus of my career has been using genetics and exploiting embryonic stem cells to understand embryology, while also developing methods to visualize cells (in vivo) in living embryos. During my time at SLRI, I began to generate the first fluorescent protein-expressing strains of mice and transgenic mouse embryonic stem cells. These kinds of reporters had worked in worms, but no one knew if they would work in mice. We did not know if mouse tissues would tolerate high levels of expression of these exogenous proteins. We went through quite a number of mice without success. When we finally managed to get an embryo with green fluorescence, we quickly began modifying embryonic stem cells so that they could be available in other colors, as well. In this way, using transgenesis, we could make lung tissues in the embryo one color and muscle tissues another color, all of which could potentially be imaged live. What I very soon came to appreciate was that the laboratory support resources at SKI are unparalleled. From the day you come on board, everything is there to support you. In 2000, after three and half years in Toronto, I decided it was time for me to move on. I had been a teaching assistant for the mouse embryology course at Cold Spring Harbor Laboratory. There I met Ginny Papaioannou, a professor at Columbia University, who was one of the invited lecturers. During our conversation, she offered me a position in her lab in New York, working on further developing the process of live imaging in mouse embryos with an emphasis on investigating the roles of a specific family of transcription factors, the T-box genes in early embryos. I was ready for the bright-lights-big-city aspect of New York. At the time, I recognized the need to improve the resolution of the imaging we were doing, hopefully finding a way to take it to the subcellular level.Three key things needed improvement: the fluorescent protein reporters, the resolution of the data and the efficacy of ex utero embryo culture. So to improve the reporters we began to give different colors to different parts of the cell — for example, one color for the nucleus and one color for the plasma membrane. The nucleus would be a descriptor of a cell’s position, and the plasma membrane would provide a read-out of the cell’s shape, which, together, would tell us what kind of cell we were looking at. At Columbia, I optimized methods for culturing embryos on a microscope stage, a necessary prerequisite for in vivo imaging. I think Ginny thought I was a mad Brit, but I also think she concluded, “OK, I can have one crazy postdoc for the amusement of the rest of the lab!” The freedom she provided me was wonderful, and because of it I was able to make the progress I did. In 2002, I gave a presentation at a mouse meeting held at Cold Spring Harbor Laboratory and there met Kathryn Anderson, who was giving the Rosa Beddington memorial lecture — named in honor of Rosa, who had by this time died of breast cancer. It had been recognized that the Sloan Kettering Institute (SKI) would be better served with an independent developmental biology program, and Kathryn was designated as the chair. I was the first recruit into the program, interviewing in 2003 and arriving in 2004. I made the decision to come because it was too great an opportunity at too great of an institution to pass up. And, most importantly for me, Kathryn was running the program. I knew she had the breadth of understanding and insight to put together a unique, world-class program. What I also very soon came to appreciate was that the laboratory support resources at SKI are unparalleled. From the day you come on board, everything is there to support you. It was great to work with the lab operations group to tailor my own lab in precisely the way I needed to build it. In my laboratory at SKI, my long-term goals are to gain insight into the critical events underlying the morphogenesis of the early mammalian embryo. We use a combination of approaches, including genetics and in vivo imaging, to understand how mouse embryos are built and how their stem cell populations are specified and maintained. We use the mouse because it is the premier genetically tractable mammalian model organism. In other words, what is important in the mouse is likely also to be important in humans. The goalpost is always changing in science. Results from one experiment raise new questions and can change our direction going forward. When I started my lab I decided that in order to have insight into later developmental events we needed first to understand how some of the earliest decisions are made. Specifically we want to know how and where the first stem cell population arises. These early stem cells are special in that they are pluripotent, meaning that they give rise to all the cells of the fetus and adult organism. These cells are also of much interest at the moment as they are the ones that can be “captured” in culture as embryonic stem (or ES) cells. ES cells can be propagated indefinitely in culture and directed to differentiate into specific cell types, providing the foundation for cell-based therapies. By imaging cells in vivo in early mouse embryos we were surprised to find that things were not as we expected. Cells have a choice — they can adopt one of two alternative identities, pluripotency or differentiation. Intriguingly, we noticed that cells start off by having a bit of an identity crisis — stochastically expressing genes and proteins associated with both pluripotency and differentiation. But later they “lock” into their identity by turning off one set of genes and maintaining the expression of the other. Having made this decision they rearrange themselves - they keep or change their nearest neighbors depending on who their neighbors are. As a result, the pluripotent stem cells end up clustered in one location. To unravel the molecular mechanisms regulating these events, we are investigating the behaviors of cells in mutant embryos that either fail to specify or fail to cluster these two distinct cell types. This is the first time the behavior of pluripotent cells has been directly visualized in their native environment. I believe this study will shed light on both the cell behaviors and molecular mechanisms directing the formation of the pluripotent cells in the blastocyst stage of mouse embryos, which architecturally resemble the human embryo at the blastocyst stage. So, at a fundamental level, we are figuring out how human embryonic stem cells arise in vivo. The pluripotent stem cell population is referred to as the epiblast. In vivo the pluripotent stage is transient. Shortly after the blastocyst stage the process of gastrulation transforms the epiblast into the three germ layers of the embryo, namely the ectoderm, mesoderm and endoderm. The dogmatic belief is that during gastrulation cell rearrangements bring about the spatial separation of epiblast-derived embryonic tissue from extra-embryonic tissues. Essentially extra-embryonic tissues get pushed out of the way, so that having formed the three germ layers the embryo can continue to develop and form the organ systems required for adult life. What we wanted to know is how exactly extra-embryonic tissue gets pushed out of the way of the embryo, so again we decided to watch it happen. To our surprise, our live-imaging studies revealed that embryonic and extra-embryonic tissues are not completely segregated, and that extra-embryonic cells are not pushed out of the way as everyone believed. Unexpectedly, we found that extra-embryonic tissues likely contribute cells to the respiratory and digestive tracts and associated organs such as the lung, liver, and pancreas. In essence, our studies have revealed the existence of a fourth germ layer. We don’t yet know what this means, but the next step will be to determine where these cells end up in the adult and if these cells are any different from their neighbors during both normal life and disease progression.